So what does a pastor type listen to music wise as they sit in the hospital hours upon hours waiting a diagnosis? To ask it another way? What do they listen to as they sit hour upon hour as chemo drugs are pumped into their body praying that God will use the doctors and nurses as instruments of healing? If you had a chance to look at my I-Pod you would soon realize my musical tastes fall all over the map. As a child of the 80’s I love some of the greatest music ever made…the stuff people are still “sampling” today as they work to create something “fresh”. You will also find some Benedictine Monks chanting and other quiet prayer music that helps me get quiet and still in the midst of chaos. You will also find a mixture of some of the best praise and worship music I have come across over the years…everything from the traditional hymns to native American Indian drums lifting up praise to God. does this pastor type listen to over the past few weeks? Well, I have been drawn back to one of my old favorites and have spent hours listening to the music of U2. I went through all their music on my i-tunes and came up with a playlist with every song that points to God. There are many, one of my favorites is “40” (which our worship team has learned and can play very well these days!). I had “40” playing on a loop for an entire night in the hospital. There was something peaceful about it. I have watched (via Youtube) U2 lead a stadium with tens of thousands of people in worship as the crowd joins in singing the words of Psalm 40. There is something sacred about the sound of the crowd joining with the band and then continuing after the band has left the stage. There is something universal in the cry of Psalm 40. There is something equally universal in question How Long? 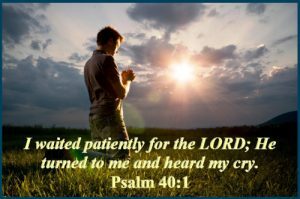 How long do I have to sing this song…to wait patiently before you will hear my cry and lift me up out of the pit and set my feet on solid rock? A few days ago I walked into Best Buy. I was there to buy headphones. As I walked up and down the aisles I was struck by two realities. As people walked past me they were totally unaware of what was going on in my world. They had no clue how upside down it was and what Nancy and I were dealing with. The second thought that hit me was how often I have walked blindly through this world past people who are struggling with issues much greater than mine. There are people all over this world, in each of our communities crying out “How long, how long, how long, how long to sing this song”. They desperately want and need to experience the grace and mercy of God at work in their lives. Pray for the eyes of Jesus…to see people as he would. Pray for the hears of Jesus…to hear people as he would. Pray for the heart of Jesus…so we can move towards them in love…helping people experience peace. Dan, I hated to hear the news about your situation. Know that we are sending prayers for you, your family and your church.